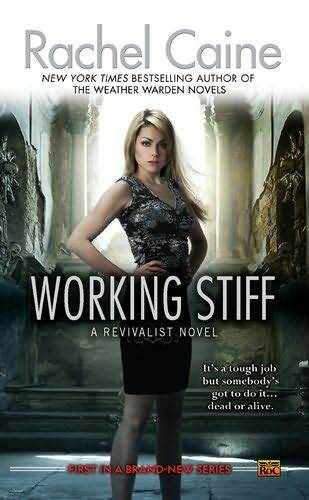 When Bryn Davis goes to Fairview Mortuary for her first day of work, she sure as hell didn't expect it to become the day from hell! Seriously. Sure, her boss seems nice enough and is keen to train her thoroughly, but anything that can go wrong, does. Not to mention that she stumbles onto a disturbing secret big enough to get her killed. OMG, I absolutely loved this book! Everything about it was fantastic. It was a very unique twist to the zombie genre, that's for sure. I really liked Bryn. The poor thing goes from one bad situation and into another, becoming a pawn in a very dangerous game. Not to mention that she's not exactly human and has to deal with that every single day of her life. Oh, and McCallister. Yeah, he was cool too. If there's one thing Rachel Caine can do very well is write memorable, strong heroines and mysterious, brave heroes. Then she likes to throw this winning combination into impossible situations. The tension in this book kept me guessing from start to finish, and I couldn't wait to see what would happen next. Not to mention that even the secondary characters were awesome! Mr. French was a cutie. Oh, and Manny Glickman and Pansy Taylor from The Red Letter Days series make an appearance. I loved it.